FAQ - Northwest Spray & Compressor, Inc.
How do I select the correct paint sprayer for my application? How do I choose the right spray tip? Why can't I achieve a proper spray pattern? How do I WINTERIZE my airless paint sprayer? 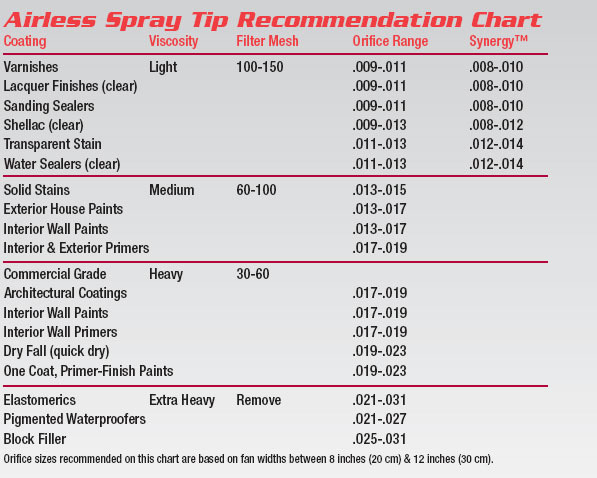 Q: How do I select the correct paint sprayer for my application? 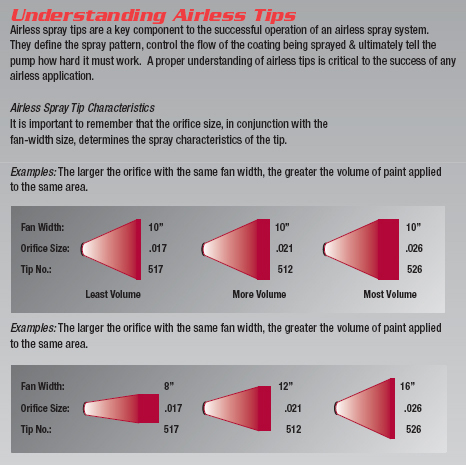 Q: How do I choose the right spray tip? Q: Why can't I achieve a proper spray pattern? A: The sprayer design is an on demand system. When the gun trigger is pulled the sprayer should cycle. If the sprayer is running continuously read below: The inlet or outlet check valve is stuck open. Shut the sprayer off, un-plug the electric cord, and rotate the prime/spray valve handle down to relieve any pressure in the sprayer, and remove the blue paint hose from the sprayer. Unscrew the inlet and outlet check valves. Clean the ball and seat of each valve. Remove all debris and inspect the ball to make sure that it is loose and can sit tightly on the seat. Inspect the o-ring around the valve housing for damage and replace if necessary. Screw the valve back into the pump and securely attach the hose.